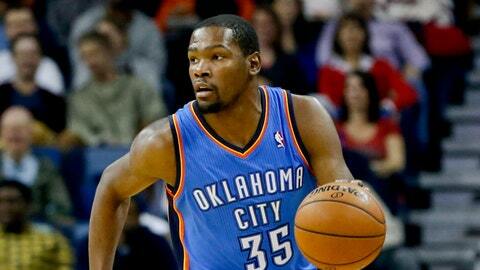 Kevin Durant has to put in some effort to get a home-cooked meal. So he’s doing what any person rich enough would do in such a situation: He’s opening his own restaurant. Kd’s Southern Cuisine opened in the lower Bricktown section of Oklahoma City, the Miami Herald reports, featuring southern-style food like fried catfish, barbecued pork ribs and collard greens. Durant said in a news release that he hopes the cuisine and atmosphere "feels like home"— a very, very expensive home, apparently. Although the regular menu will feature items ranging from $10 to $25, the restaurant reportedly will also feature a "Baller Menu" with higher priced items, like a $52 steak. Kd’s will also feature a two-story wine room and a private area with space for a DJ, according to the Herald. You know, just like home. Durant won’t be the first famous athlete to have a restaurant in OKC. Broncos wide receiver Wes Welker, an Oklahoma City native, opened Wes Welker’s Sports Bar & Grill there in July.